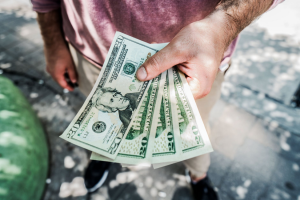 Have you been looking at your bank account recently and thinking “I need money?” If so, you’ve likely thought about ways that you can make money. Most people assume that they have to pick up a part-time or seasonal job, but as we all know, this process can take weeks. For people who need money immediately, there are quicker and more convenient ways to increase your income. Keep reading to learn about 5 ways that you can make more money each month. Each one of these money-making gigs offer flexibility, allowing you to work as much or as little as your schedule allows. The internet is good for many things, but one of the best things to come out of the internet is the endless amount of freelance jobs. Online you can find graphic design work, content creation, proofreading, translation, and many other side gigs that can make you some serious cash. As a freelance worker, you’ll need to build a client base so that you have a steady stream of work each week. While freelancing can start off as a side hustle, it can easily turn into a part-time or even a full-time job. If you’re new to freelancing, you can expect to make no less than $10 an hour, though some projects will pay on a per word or per assignment basis, depending on the type of work that you offer. One of the simplest ways to increase your cash flow is to sell items you don’t need. There are plenty of people out there who are willing to purchase used items that are in good condition. While you could hold a yard sale, you’re most likely to get the most views by listing your items online. Be sure to use websites like Craigslist, eBay, and eBid so that people in your area can view pictures and descriptions of things that you have for sale. On the flipside, if you’re not too keen on the idea of selling your stuff, you can also rent certain items to people. For example, if you own musical instruments that you no longer use, you can rent them to aspiring musicians who are looking for a less expensive way to perfect their craft. You can also rent your car and even your home! With renting, be sure that you use a reliable and well-known website. If you want to rent your home out, become a host on Airbnb. To rent out your car you can use Turo. Owning a vehicle can be quite expensive. Not only do you have to pay for gas, but there are also maintenance costs and insurance fees that you have to pay. But what if you could turn your vehicle from being a money pit to a money maker? There are all sorts of side gigs that involve using your car to make some cash. One of the most common options is to work as an Uber or Lyft driver. With this job, you’ll be responsible for getting passengers from Point A to Point B. But what if you don’t have a car that allows many passengers? Another effective way to make money using your vehicle is to offer delivery services for food ordering companies like Grub Hub, Eat24, and Door Dash. As a driver, you can earn $20 an hour or more, depending on how often you work and how much your customers tip you. Just as you can work as a freelancer offering a variety of services, you’ll also find that there are websites that pay users to complete different tasks. For example, on Survey Junkie you can take surveys and get paid. On Swagbucks you can watch videos and even play games to make money. By completing random online tasks to make money, you don’t have to worry about a set schedule or meeting deadlines from clients. Instead, you complete tasks on your own schedule. This gives you much more freedom and ensures your everyday life isn’t impacted. Making money in today’s world is much easier than ever before. By using one or a few of the options on this list, you’ll never have to worry about running out of money or being strapped for cash before your next payday.